Absolutely spellbinding! 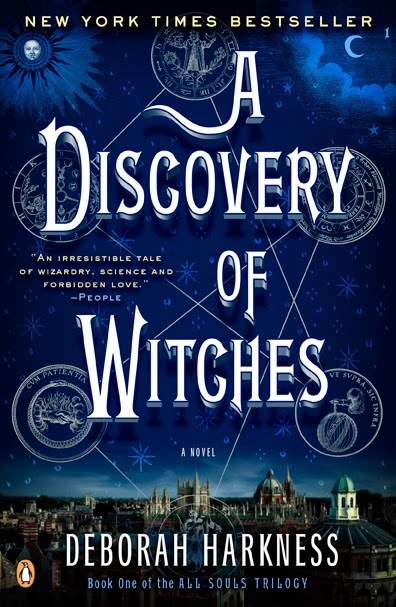 Deborah Harkness crafts a magical tale about a reluctant witch, a fifteen hundred year old vampire with a taste for wine, and a long lost alchemical manuscript that is about to turn their world upside down. Alchemy, history, and magic collide in this complex and beautifully executed paranormal romance. And oh the romance! A whirlwind courtship, a forbidden alliance, and Matthew Clairmont – you’ll want to discover it all for yourself. A Discovery of Witches is a true delight. 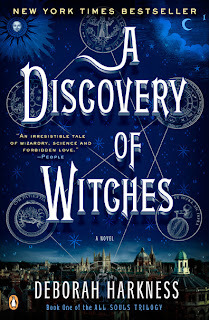 I must say this is where my love affair with a book began – I fell head over heels with A Discover of Witches, and each time I read, re-read, or listen to it [speaking of which, Jennifer Ikeda does a superb narration of the novel] I can’t help but fall in love over and over again. It is truly magical. I first read the novel last summer, having picked it up on a whim. I still remember how captivated I was by it, I couldn’t put the book down, racing through the pages and finishing it in the wee morning hours [work be damned]. My need to share my love and learn more of this magical book brought me to the All Souls Trilogy Discussion group on Facebook which is a wonderful resource, a wealth of information for those readers wanting to see beyond the text of the book, and an amazing group of people, but I digress. There are a lot of different reviews out there, both good and bad and I get a strong sense that those are divided primarily between lovers and haters. So perhaps this is not the book for everyone, its impressive size and a fairly slow start might turn some readers off, but those who stick around will most certainly be rewarded. Once the story picks up the speed there is plenty of action, romance, suspense, and of course magic to keep the reader captivated. Diana Bishop, the heroine of the novel, is a witch from a long line of witches. But traumatized at an early age by the death of her parents Diana decides to forsake her gift choosing academia instead. Now in her early thirties, she has become an alchemical history professor at Yale, and in preparation for a conference where she is to present, Diana travels to Oxford to research at the Bodleian Library when she accidently calls up an enchanted manuscript known as Ashmole 782. Matthew Clairmont is a vampire who has led many different lives throughout the years. Secretive and reclusive, he has extensive credentials to his name but his current focus lies in the field of genetics. When Matthew hears talk of a long lost manuscript being uncovered by a witch he has to check for himself. Soon his meeting with Diana grows into something more than his wish to posses the manuscript. Slowly Diana and Matthew grow to trust each other, forming a forbidden alliance – witch and vampire, as an ominous threat of war is brewing on the horizon. A delightful cast of characters – well fleshed out and each with their own distinctive voice, fill the novel. [The Bishop house alone is a character in its own right.] Deliciously descriptive locations that are explored throughout the novel will have you packing your bags for a world-wide tour of Europe. And the layers of history add depth and will send the most curious of readers into an excited search for more information [Easter egg galore awaits you]. So if you are waiting to find that one fabulous book, look no further and prepare to fall under the magical spell of A Discovery of Witches! Aww!!! I absolutely adore this series Kim! I've read it a number of times and just been meaning to write up something on the blog about it... and I finally did. Can't wait to read the final book next year. Oh I'm glad Alise! :) I must admit this is one of my favorite books and I hope you enjoy it too. Please let me know if you do pick it up! I haven't read The Night Circus myself but a lot of friends of mine who love A Discovery of Witches enjoyed it as well.